Shoulder pain can be problematic for weightlifters and bodybuilders. Regenerative therapies focus on repair of injured tissue. 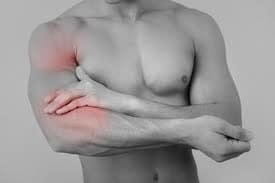 Platelet Rich Plasma (PRP) is a regenerative procedure that may be used to treat shoulder ailments. Commonly injured shoulder regions in the weightlifter are the rotator cuff and the bicep tendon. 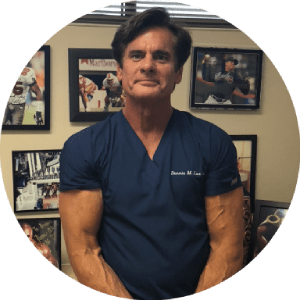 Dr. Lox has successfully treated both rotator cuff problems and bicep tendon injuries with Platelet Rich Plasma (PRP). This case illustrates the successful treatment of a partially torn short head of the bicep with PRP. Athletes interested in returning to full sports participation quickly are interested in regenerative therapies that are conservative focus on repair and may expedite faster recovery. Platelet Rich Plasma (PRP) releases growth factors which aid in repair and regeneration. Following a weightlifting injury the athlete experienced pain in the anterior shoulder. The injury did not heal in a timely fashion and an MRI confirmed a partial bicep tendon tear. The patient elected to have PRP therapy with Dr. Lox. Pain resolved within 2 weeks. Rehabilitation exercises were incorporated into his treatment. 12 weeks following PRP therapy he reported no limitations in weightlifting. Platelet Rich Plasma (PRP) may be of benefit in resistant shoulder pain. Athletes that impart high stress to their shoulder joint are particularly interested in the regenerative applications of PRP.